Manchester United interim boss Ole Gunnar Solskjaer has urged the likes of David de Gea and Anthony Martial to pen new contracts with the club rather than seeking fresh challenges elsewhere. The duo are currently contracted to the Red Devils until the summer of 2019, though United are likely to trigger an extension clause to prolong their deals for another 12 months. 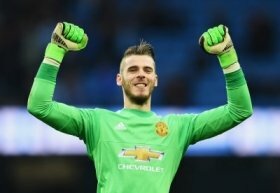 In a report covered by Standard Sport, Solskjaer has pushed De Gea and Martial to commit their futures to the Mancunian giants by stating that the grass is not always greener on the other side. “I know the club want them to sign, of course, because they are top quality players. It’s down to the players, but when you’re at Man United there isn’t a lot of greener grass on the other side," he said. United have made a mini-revival under the guidance of Ole over the past couple of weeks and a run of three successive wins sees them within three points off fifth-placed Arsenal. Still, Champions League qualification should remain the major aim for the season and United are far from achieving that at the moment with an eight-point deficit to fourth-placed Chelsea.